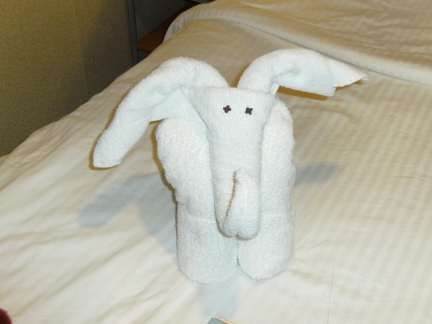 Towel Animals delight most passengers on many of the major cruise lines. I haven’t cruised on all of them (yet) so I can’t say for sure if everyone has them, but so far all the big ships I’ve sailed on with Carnival, Holland America, and Norwegian had daily towel animals. 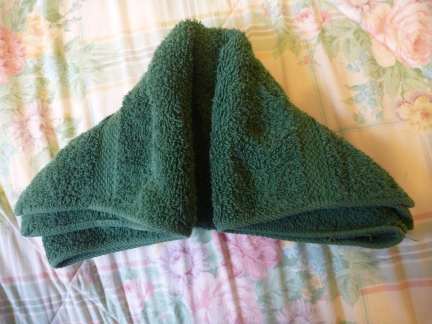 I’ve learned a lot about folding towel animals since I first wrote this blog, and now have all sorts of other blogs about folding individual towel animals. Some even have videos. 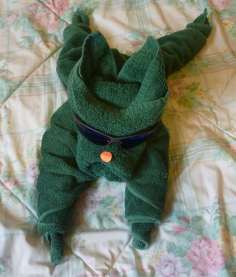 For instructions on folding specific animals, go to the towel animal page where you will find photos of every towel animal on the blog. 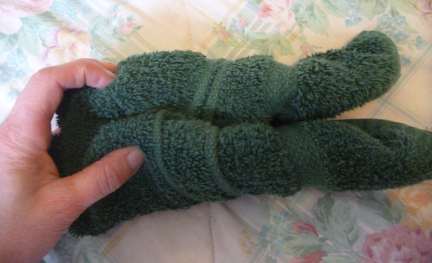 Clicking photos on the towel animal page brings you to the blog with the instructions for that specific animal. There are all sorts of different animals from ships there as well as some of my own creations and holiday towel animals. Some are very easy like the penguin and others more difficult like the fire breathing dragon. 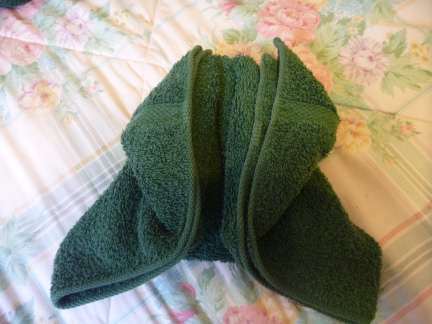 Continue reading for my first-ever towel animal folding blog. 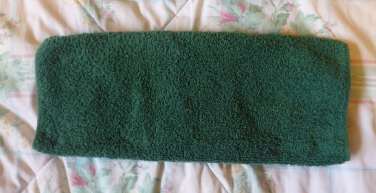 I wrote a short blog once with a towel animal poll. (You can still vote, the poll never closes.) 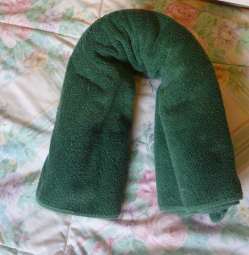 Since then I have gotten google hits from people looking for towel folding instructions. 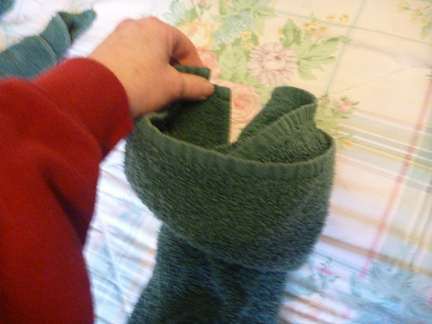 So I thought I would dust off the towel folding book and give it another shot. Amazingly enough I actually made a pretty good body, something I never managed to do before. No comment on the heads. 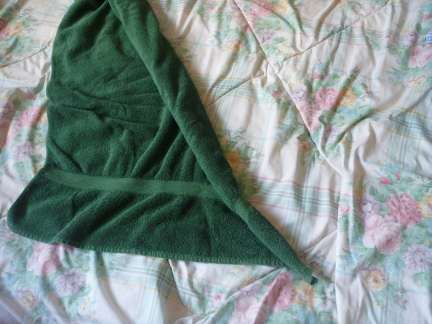 For body type A, (as shown in the book instructions above) start with a full sized towel laid out flat. 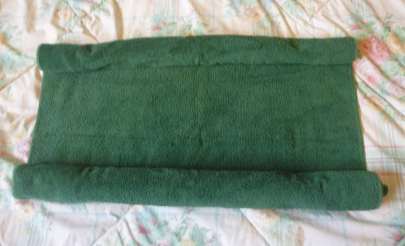 Roll both ends toward the middle. 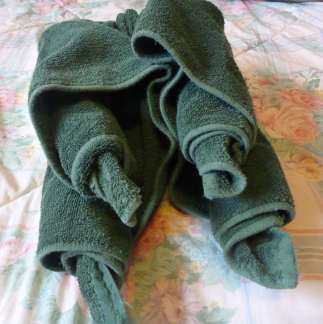 The rolls should be even in size when they meet at the middle of the towel. Fold in half with the rolls to the outside. Then pull the corner of each roll until it sticks out a little bit. Take hold of two corners next to each other (the ones on the same side of the roll) with one hand, and the other two with the other hand and pull the corners until the rolls pull into legs and the body is tight. Keep pulling until it looks like a finished body with four legs. Now we need a head for this random headless creature. The bulldog head instructions seemed too hard, so I tried making a rabbit instead. It pretty much turned out looking like a dog. Use a hand towel for the head. Fold in half crosswise. Fold in half crosswise a second time. Fold the corners down like two triangles. If it looks more like the picture in the book and less like mine it will probably look more like a rabbit and less like a dog. Tuck the pointed side in and roll both sides to the center. Try to do a better job than I did. If you have more towel to pull out the rabbit will have longer ears. Decorate with sunglasses, or bits of cloth or paper or stickers. 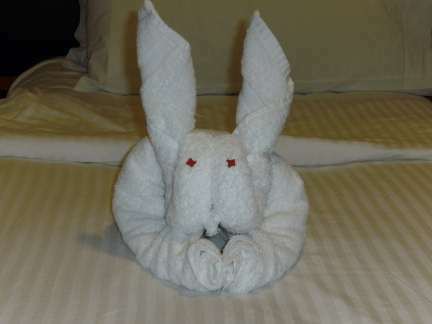 Click link for a new blog with photos and video of stateroom steward folding a towel rabbit. I made a donkey for body B, but I got lazy on the body and just took the one I’d already made and put it in a sitting position. It probably would have looked better if I made a new one. The rolls got a bit loose moving it around too much making different animals out of the same body. 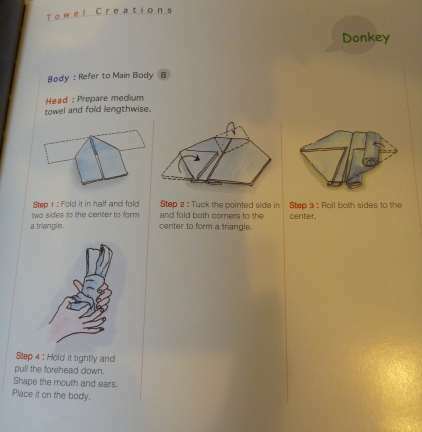 Use a hand towel for the donkey head. Fold it in half lengthwise. Then fold the corners down so it sort of forms a triangle. Fold the pointy end down and then fold the corners so it makes a smaller triangle. Roll both sides to the center. While holding the rolled sides together, pull the forehead down and tuck it so the head stays rolled. Shape the mouth and ears, then set it on the body and decorate. For anyone else who is as bad at towel animal folding as me, I invented a couple of my own no-fail, so easy anyone can fold it towel animals. First the snake. 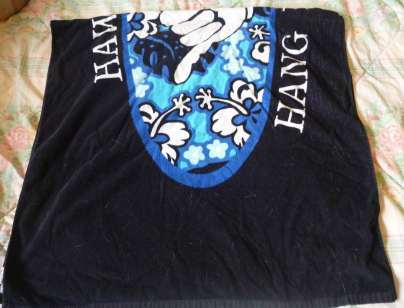 Start with a full-sized towel. Roll it so one end is small and pointy and the other end wide. Use a washcloth for the head. 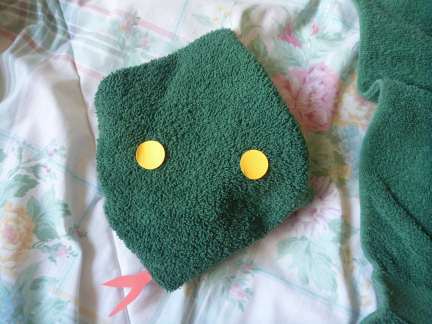 You can pretty much fold the washcloth however you want so it looks like a head. Folding it in half diagonally and then folding the two ends down to the midpoint works pretty well. Or just crunch it up into a head shape, that works too. Pretty much anything works, different snakes have different shaped heads. Put the head on the body, add eyes and a tongue and that’s it, easiest towel animal ever. 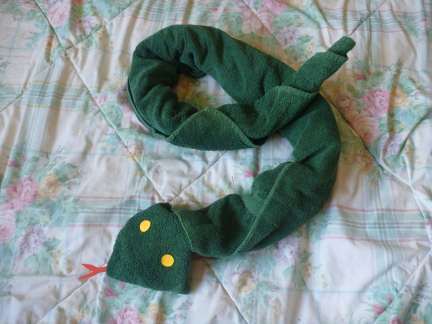 In this new blog, I have instructions on how to make a snake using just one towel. 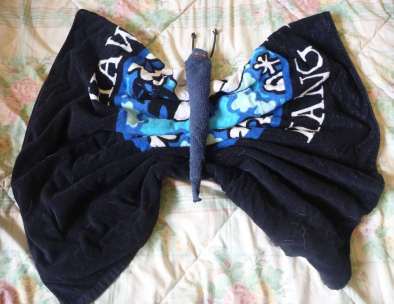 For the butterfly, use a brightly colored towel. Fold it in half crosswise. Then squish in the middle and fluff out the ends like butterfly wings. 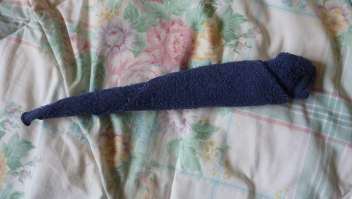 For the body, roll a washcloth with one end pointy and the other end wide. Tuck in the edge on the wide end to make the head. Put the body on the wings and decorate. I’m much better at folding towel animals now. 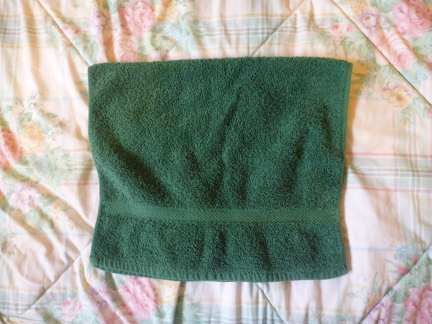 Plus I discovered that most of my issues with heads when I wrote this blog were due to the fact that my hand towels are not the right proportions for it. 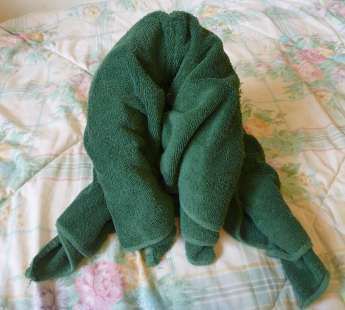 This is my new invention, the towel crab. I’m working on a series on folding individual towel animals. 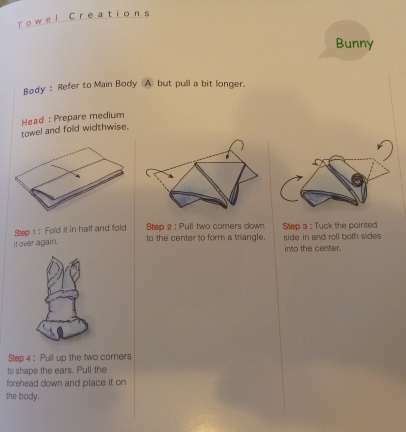 Each animal will have step by step instructions with still photos and some have a video of a stateroom steward folding the animal. It’s easy to make sure you don’t miss any upcoming animals. Just follow My Cruise Stories on twitter or networked blogs, “like” My Cruise Stories facebook page, or click the link on the sidebar to get an email or RSS subscription. Posted now: rabbit , frog, easy seal, hanging monkey, one-towel snake, pig, gorilla. turtle, cat, dog, elephant, dinosaur, penguin, bear, pigeon, better seal (sea lion or walrus), turkey and stingray, and more. 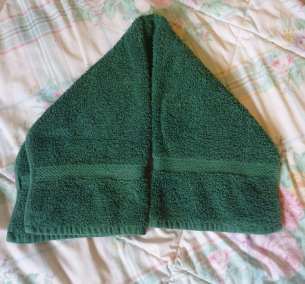 Another easy-to-make towel folding project, which also comes in useful as a gift, is the towel cake. 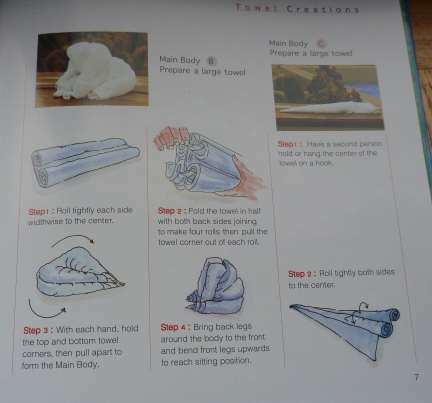 For more towel animal instructions check out the towel animal page. 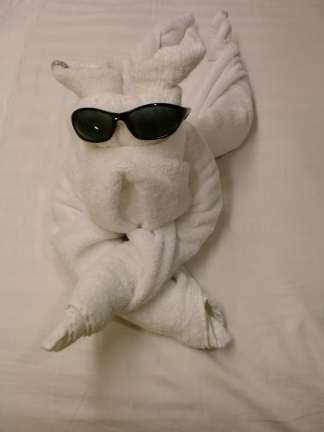 This entry was posted in Carnival, Holland America, Randoms, Towel Animals and tagged crafts, cruise ship towel animals, fun, random, towel animal folding, towel animals. Bookmark the permalink. Thanks for posting this! I’m going to try this next time I have guests! This is my first time to pay a quick visit here and i am truly impressed. Carnival has them available on board their ships. I saw one of their old ones available used at Amazon. I also googled towel animal folding book and found one called How to Make a Towel Monkey and Other Cruise Ship Favorites available at Amazon. Very intreresting post. It was very useful. I was searching exaxtly for this. Thank you for your effort. I hope you will write more such useful posts. There’s a new series I’m doing on folding individual towel animals. Each post has photos and video of a Carnival stateroom steward folding the animal. Very interesting, Cruising is as aged as the late 1900s, though to begin with they were all merchant ships. Vacationing in the center of the sea surrounded by all the water is most certainly a dream for most. Now-a-days, a satisfying cruise getaway would make an extreme impact on one’s thoughts and make them return time and once more. Not like small boats and houseboats, cruises give you luxury galore and all the travelers have the experience of living in a star resort on a ship. All the amenities supplied in cruises are equal to the kind of hospitality featured in grand hotels or resorts of the maximum cadre and make the vacationers feel at the top of the entire world for the duration of the vacation. How could you not read a post with that title (or is that just me?) 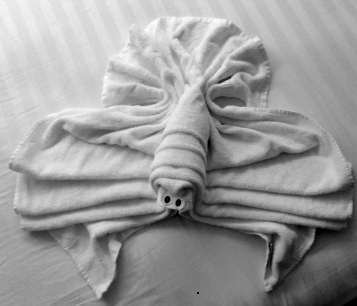 Never seen towel art before, a part of cruising I never knew I was missing out on! 😉 Now where are some towels……. I just returned from a Carnival cruise. There was a towel folding class, and it was done in the theater, with stewards to help us follow along with the emcee who was talking us through it. I did a Carnival cruise about 2 1/2 years ago on the same boat, and all we got was instructions on how to buy their book! I guess they must read the comment cards passengers turn in. 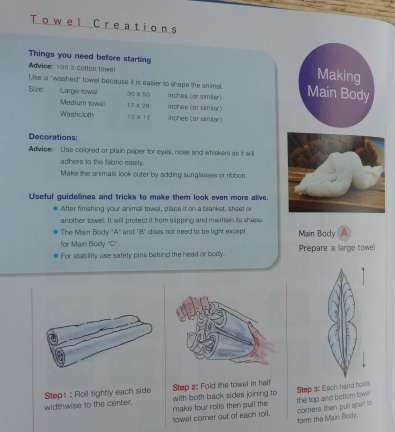 I’ve done the towel folding class on a couple different cruise lines, but it was always in a room where if you weren’t up front you couldn’t see, and English was never the first language of the presenter so they were hard to understand. The theater sounds way better for that. Impressed with your efforts and you made me smile. That can’t be bad, though I’m not a cruiser. Amazing post.I like what i saw on fb! This reminds me of origami, but with towels! 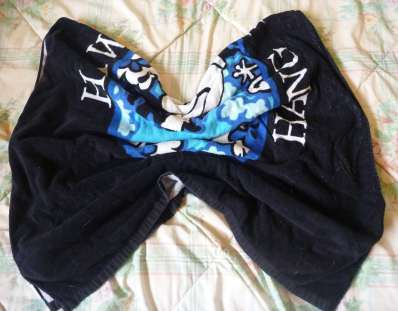 People actually do refer to it as towel origami. i love these especially the crab. Very cool and creative. I will keep this for future reference. thank you for visiting my blog. I will be tooling around yours too! Wow, that is so cool. Gonna have to try it myself – although I doubt my results would be as good. I love your lame donkey! 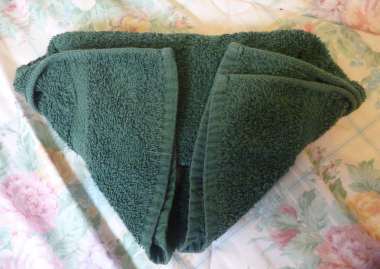 The lame donkey was one of my earliest attempts at towel animal folding. This is cool! Thank you for the great insight. 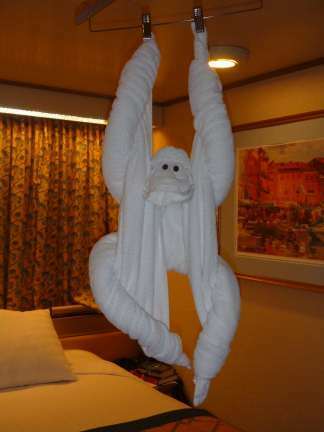 If I ever go on a cruise, something highly unlikely since I cannot swim, I would have a massive heart attack if a towel monkey were hanging over my bed. 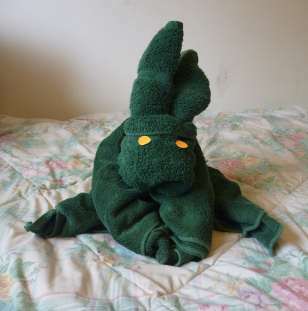 That said, I do appreciate your instructions about how to make these towel critters. That could come in useful some day. Knowing how to swim isn’t a necessity for taking a cruise, it is definitely NOT a good idea to jump overboard! Swimming in the pools or on beaches or shore excursions is totally optional. As for towel monkey prevention, you could ask your cabin steward to please not make a monkey…or a bat, they hang from the ceiling as well. Wow, they are very cool! 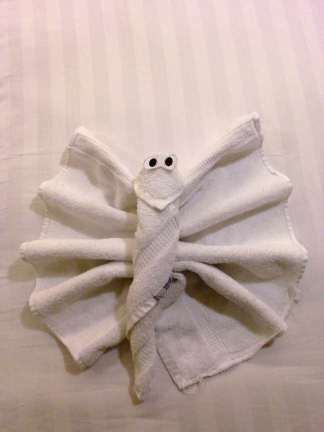 I just returned from a Carnival cruise and we took the towel folding class. It’s fun and interesting,, so I decided to look it up online and discovered this site. Our steward folded a different towel animal every night. Cool! I never had any luck with the towel animal folding classes. Either I never got a good spot where I could see, or I couldn’t hear or couldn’t understand the steward. 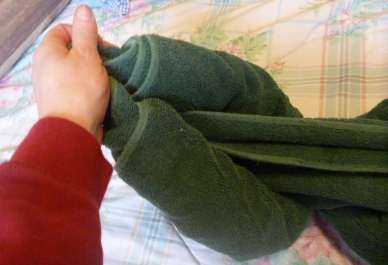 I actually learned to fold them from the videos on some of my towel folding blogs. 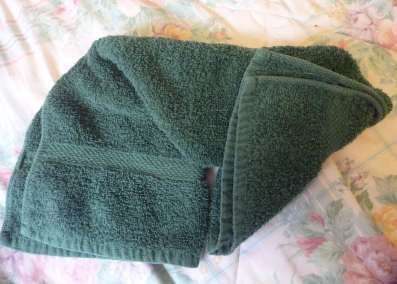 This is the first towel animal blog I wrote, the others are much better. You can find links to them all on my towel animal page.